This chapter introduces a practical model for teacher educators concerned with designing online courses for inservice teachers' technological knowledge learning and its implementation in their teaching. A double-layered CoP model has been developed and repeatedly applied in the teacher professional development (TPD) context using a design-based research (DBR) approach. DBR provides an iterative cycle of design, implementation, evaluation and improvement of the design. This chapter includes a detailed description of the design context of the model including design considerations and theoretical frameworks upon which the model is based. The chapter also demonstrates how the model works in practice referencing important issues in current teacher education practices and offering suggestions for how DBR can guide teacher educators' teaching and research practices. Four course participants' learning experiences are presented as case studies to illustrate more clearly the way the model seems to be facilitating teachers' learning processes. 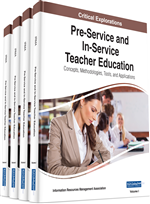 The purpose of this chapter is to provide teacher educators with a practical model of an effective online course design for inservice teacher professional development (TPD). A double-layered Community of Practice (CoP) model has been developed and implemented in a graduate-level course at a North American teachers’ college for the last three years. The particular educational context in which the model was developed is that of inservice teachers’ technological knowledge learning and its effective implementation in classroom teaching. We think this model can provide a useful framework for teacher educators concerned with helping inservice teachers improve their practices using new technologies. To develop the model, we took a design-based research (DBR) approach. The important methodological advantage of the DBR approach is that is supports the iterative cycle of design, implementation, evaluation and improvement of a theoretically-driven design (Wang & Hannafin, 2005). Using DBR, we repeatedly applied the double-layered CoP model in our online TPD course design and teaching practices, and systematically evaluated and revised the design. Throughout three iterations of our DBR process, significant components of the model (e.g. course structure, learning activities, and instructional strategies) have been refined. We therefore argue that DBR is an appropriate methodological approach in the field of teacher education where a gap between theory and practice is often reported as a chief concern (e.g. Cochran-Smith, & Lytle, 1990; Grossman, Hammerness, & McDonald, 2009). There has been a lack of research efforts to provide a systematic course design model for inservice teachers’ technological knowledge learning. To find a concrete example of an effective online TPD course for this purpose is even harder in the current literature where most online courses are not designed for inservice TPD but rather for teacher preparation programs. Studies have focused on the application of a single communication medium (e.g. Blogs or Wikis) in face-to-face or blended TPD contexts rather than developing a fully online course. Researchers focused on online course design have also limited their investigations to the effects of a single component of an online course (e.g. learning activities or evaluation methods) on participants’ perceptions or interaction patterns within a course. Considering the importance of educational uses of new technologies and the increasing demands for inservice TPD programs focused on this topic, developing a comprehensive model for effective online TPD course design is an important task for teacher educators. This chapter, therefore, offers a concrete case of what an effective online TPD course can look like and practical guidelines for how to design and teach the course. In order to illustrate the way the double-layered CoP model is working, we include case studies on four teachers in the course. The specific research questions informing our investigations are: “what are inservice teachers’ learning experiences in the online course based on the double-layered CoP model?” and “how does the model effectively facilitate the inservice teachers’ learning?” In addition, we want to demonstrate the value and usefulness of the DBR approach by detailing our DBR project for developing the double-layered CoP model and sharing important findings from our experiences. Although we emphasize the practical application of the double-layered CoP model for inservice TPD practices, we want to acknowledge the complex nature of teacher education. Education as a whole is a social practice that involves multifaceted issues and various stakeholders. Despite ongoing efforts to address diverse educational issues and provide the “right” or at least “better” education for all, such attempts have not been consistently successful. Thus, we do not perceive our model as the ultimate solution for all issues in teacher education related to inservice teachers’ technological knowledge learning. Instead, we are aware of the importance of having a comprehensive understanding of the particular education context in which each teacher education practice is situated, because multiple factors have contributed to the slow and inconsistent implementation of technologies in schools (e.g. Cuban, 2001; 2013; Karagiorgi & Charalambous, 2006).